We started the year off focused on collaboration and teamwork. 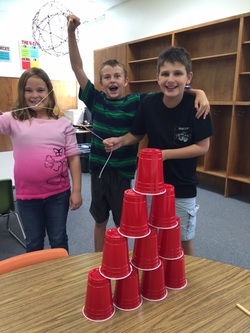 Students were issued a challenge, to build a solo cup pyramid with only cups, a rubber band, and string. No one could touch anything but the string. After finally figuring out a method to accomplish the task, students had a chance to talk about how good teamwork and communication made success happen. Third grade GT students began an exploration of the question: Was the Trojan Horse myth or military history? They generated questions that they had to research in order to answer their driving questions and posted their results in a tri-fold board. Students located the ruins of the city of Troy and explored archaeological ruins as well as legend and myth surrounding the Battle of Troy. Using math skills, students recreated a scale model of the Trojan Horse and documented the building process. Ultimately, students wanted to share some of their findings and their Trojan Horse with their school, so they posted their research board and the Popsicle horse in the hallway for classes to see as they passed. History, research, myth, and math all in one question. 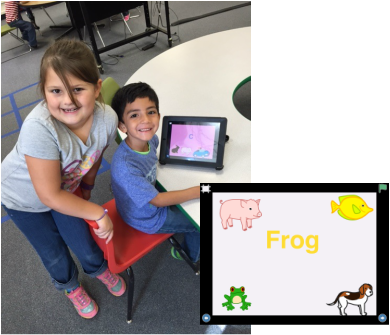 First and second grade GT students are bringing their stories to life and dedicating themselves to creating a book length work that can be published and made available in their school libraries for others to share. Students brainstormed ideas, developed an outline, are writing their stories, creating illustrations, and preparing for publication. Through sustained effort and tenacity comes success. Publication date is Fall of 2016. First and second grade students are beginning an exploration of electricity and circuits. With just a little time left before the break, they decided that a fun way to share electrical circuits with their school is through Christmas lights. 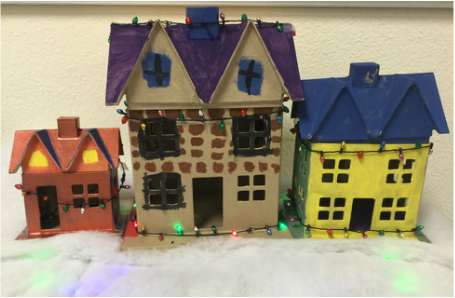 Students painted the houses and planned the lights on houses and in the "snow". A study of matter is a study of everything. Broad topic, but patterns emerged and students are learning how patterns of atoms at the elemental level go together to make molecules and all forms of matter. Some react with one another. Students explored how the molecules that make up soap and milk repel each other like magnets and take colors along for the ride. Check out pic above of one of the experiments. First and second grade GT students shared the programs they created with Mrs. Cortez's and Mrs. Hutto's Kindergarten classes, Kindergarten students loved hearing the familiar voices narrate the game. Once their story board was done, students began building the backdrops and sets to film their story. Stop Motion is a video creation process that joins incremental photographs together to create a sense of motion. 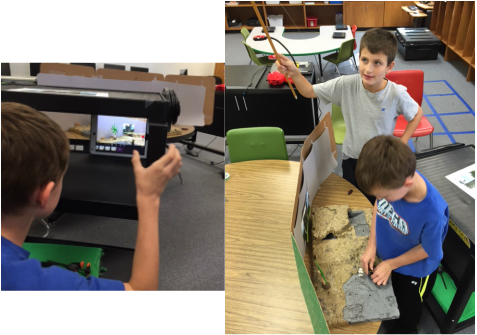 In the images above, you can see how the boys built their scene and how it looks through the "lens" of the iPad as they take each individual picture. Third grade GT students have reviewed story elements using Read, Write, Think and have written an original short story scene by scene. After building backgrounds and sets for the action to take place, they will use the iStop Motion App to capture the story one picture at a time with stop motion. Making the slightest changes in the scene with each shot, pictures are joined together to create a video, telling their story. First and second grade students are starting to explore computer coding. They began with activities off of the computer, teaching algorithms to a Flubby (ask your student). They learned the process of programming by building chunks of code at a time, adding loops (infinite and otherwise), if-then statements, adding speech, speed, movements, and action to their creations through code. Watch for finished work and games linked here soon. For the first several meeting times, we all had a chance to get to know each other. Students shared interests and ideas for the year by telling the story of "Me". Using graphic organizer model, they shared their likes, interests, families, and history with me and their classmates. They learned about elements of a story and how to storyboard a multi-media project to tell their video auto-biography using an app called Shadow Puppet. They showed great digital citizenship when they decided that the video is something they would like to share with their families and classmates, but maybe not on the Internet.